If you are new to Android Google Map 2 than must read first part of android Google map 2 tutorial. In previous post, I covered all basic things related to Google map object, marker, shapes, my location, camera movement, map types, etc. 1. How to find bearing between two latitude and longitude? 2. How to find direction between two latitude and longitude? 3. How to find distance between two latitude and longitude? 4. How to draw line between two latitude and longitude according to walking & driving direction? At the end of post, I will share my project which will have more functionality than this post. + "&sensor=false&units=metric&mode="+direction; //direction="walking" or "driving"
I have given some code examples in previous and this post to understand Google map 2 deeply and working on it easily. Some user wants voice as well in android map, so I added voice code in comment to help all developers. Project contains Login, Registration and searching Friends functionality as well. Download complete project from Github: Android Google Map 2 or download and check APK file in your android device. May i know how to add a search bar to search the location 2, then calculate the distance between the current location and the location 2? 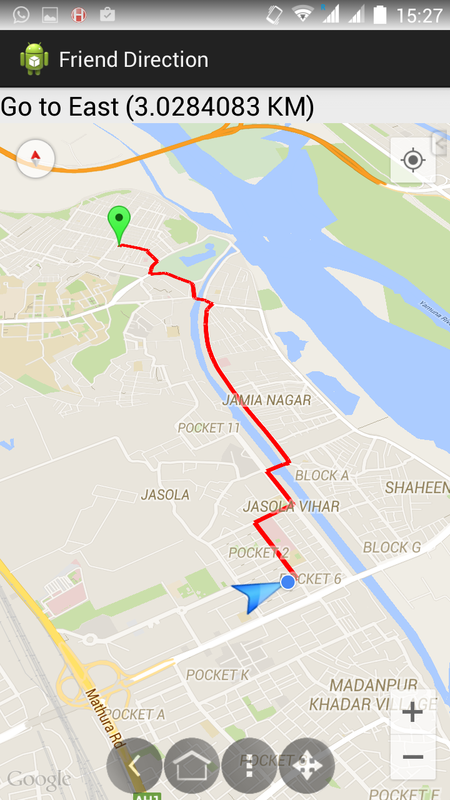 check official site and get lat and long of other place and calculate distance easily. do you mean the google developer page? which Object Use in polylines.add(polyline) in DoPost Method....Pls....answer ? how can we share current location (similar to whatsapp) to selected people? i got an error in signin.java.when i click on button continue "Error parsing data org.json.JSONException: Value <br of type java.lang.String cannot be converted to JSONObject"
thank you for tutorial. may i know finally code for direction from current location to other location. not in your source code Friend Location. because in source code Friend Location is difficult for me. I want to open this project in android studio .Please anyone tell me the process. Sir please update this exmaple for latest android. Dear Sir this example is very useful so please update it with latest android version for us. please sir,thanks in advance.